Pannacotta a delectable Italian dessert has gained unbelievable momentum across the globe, and has indeed come to stay in many households. A dessert that melts in your mouth as soon as it makes its entry, makes your eyes glow with pleasure and whisks you to the path of paradise. It is no more uncommon now and is quite a welcome dessert for any occasion, particularly in my house, where my better half and my offspring wait palpitatingly to taste anything that is new. 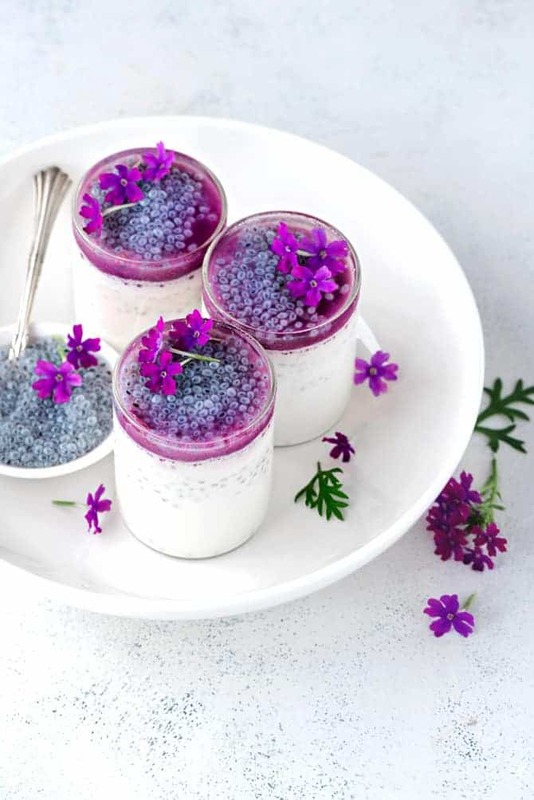 I had decided to try something unusual for Eid this time, and Lemongrass Basil Seeds Pannacotta with Jamun Sauce flitted through my mind like a butterfly which has the wings of white and purple and speckled with small polka dots all over them. The flavour of lemongrass infused with milk and cream gives out a heady aroma along with the basil seeds. Basil seeds are extremely beneficial to one’s health like helping in weight loss, controlling blood sugar levels etc. gives a beautiful texture to the dish and also lends an exquisite look to the dessert when coated with jamun sauce. Jamun has always been my favorite berry fruit, all my childhood, when I was in Mumbai, gorgeous purple pulpy plumpy jamun were easily available every where during their season. Post marriage when I shifted to Bangalore, I was sad to see how difficult it was to source jamun then.Now adays, I can see good jamun at few more places here. After a diligent search for good Jamuns which unfortunately are seasonal, I finally triumphed in getting this juicy and fleshy fruit from a shop. Do you know, how beautiful compote/sauce jamun gives? After munching on a big batch of Jamun, remaining I decided to turn it into beautiful bold and vivid, silky textured sweet sauce. And, they were perfect to pair up with delicous creamy lemongrass flavoured Pannacotta along with basil seeds (sabja) to give a crunch to it. Lemon grass pannacotta with basil seeds and Jamun sauce adorned the our Potluck spread on Eid! Lemongrass Basil Seeds Pannacotta and Jamun Sauce. In a heavy bottomed pan, add the cream and milk and heat on medium flame making sure it doesn’t boil, just heated. Turn off the flame, add the chopped lemon grass, vanilla essence and mix well. Cover with lid and keep aside for 30 minutes. The flavour of the lemon grass gradually steeps into the milk and cream concoction. In another pan, add the pureed jamun, lemon zest, lemon juice, sugar and water. Bring it to boil and let it simmer till the sauce thickens and has a glossy texture. If you prefer the sauce a little thin you may add some water. Once done, turn off the flame and let it cool completely. In a bowl sprinkle gelatine over a few tablespoons of water and allow it to bloom for about 5 minutes. Strain the Pannacotta cream, discard the lemongrass stalks and pour it in the pan again and heat it, it shouldn’t boil. Add sugar and gelatine. Mix until the gelatine blends well. 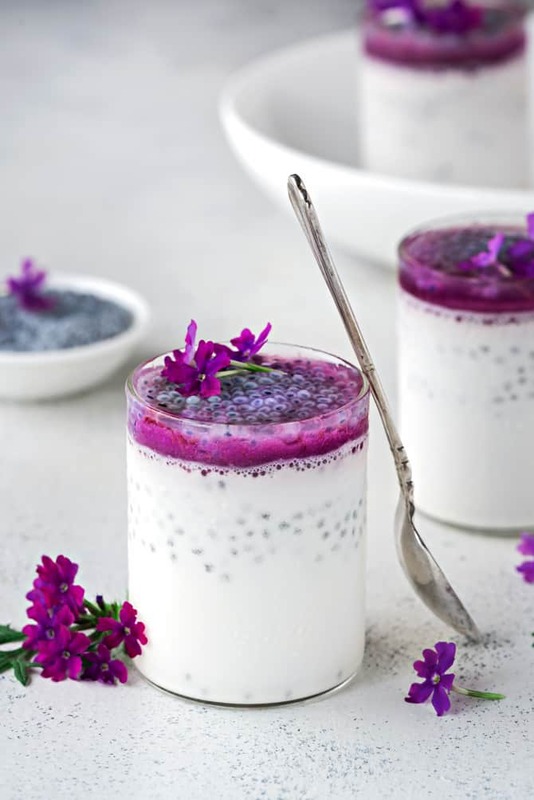 Pour the Pannacotta in serving glasses, add the basil seeds in each glasses and refrigerate until it sets. Top with jamun sauce and basil seeds. Jamun is also known as Jamul, Java Plum in English but as it’s an Indian fruit it’s referred to as Jamun only. It looks beautiful. Such a treat for the eyes.